Especially designed for elevator monitoring and control. High Performance with 300Mbps, 680MHz and 64M. Long-range transmitting distance of 3.5KM. 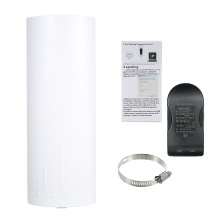 Provide you with wifi signal with high transmission efficiency. Stability has been improved by 80% with 9531 chip. Point-to-point connection makes transmission smoother, signal more stable and having more advantages in monitoring. The mainboard core has passed industrial processor. All parts are new and use AR9344 industrial chip with high transmission efficiency and high data throughput. Convenient installation. Plug & Play. Wireless access(A+B) automatically. Widely compatitble with Windows7,Windows8,WindowsXP,Windows2000,Mac OS X,Linux and so on. Long durability and high quality material of ABS lead to rain resistance, thunder resistance, freeze resistance and sun resistance.